This is the first article of a series of six that aim to detail how technology is reshaping the insurance industry alongside six main areas. Let’s start with Digital Health as the health sector is one of the three main areas of the insurance industry alongside with Life, and Property & Casualty (P&C). This is a huge market with $1,400B of gross-written-premium in 2017 according to McKinsey. Public spendings on health and long-term care in OECD countries is to increase to 14% by 2060 (vs. ~6% today) according to OECD predictions. But as life is extending and diseases are becoming costlier, insurance players are increasingly looking for ways to prevent customers from being ill and to make it more cost-effective to cure diseases. This is where technology should help. Technology started to enter in our lives with several players developing wearables focused on fitness, sport and wellbeing. In early days Fitbit developed hardware pieces to monitor the number of steps you do every day. Now it is going deeper with health-related devices like connected-scales and watches that monitor your heart rate. It recently bought out Twine Health to be able to manage more complex data on hypertension and diabetes. And it made a clear move to accelerate on diabetes, by investing $6M in Sano that makes a patch to track blood sugar. Nokia has entered the wearables space as well in May 2016 when it bought out Withings a Digital Health hardware maker for $170M. In June 2017 it was rebranded ‘Nokia Health’ to make it even clearer that health was its focus, though it is currently questioning this business line. More recently we saw Apple developing new features on its smartwatch to improve from fitness coverage to digital health capacities. Its sensors are so relevant that a recent clinical study shows it can detect diabetes with an 85% accuracy. And last year, the University of California San Francisco concluded the watch is 97% accurate in detecting the most common abnormal heart rhythm. Apple even embedded a ‘Health Records’ section directly into its new release of iOS so that you can easily store all your health data in one place whether you had a consultation with your doctor, spent days at hospital or had medical tests. Google on its side, started to track health data from 10,000 volunteers to create a map of human health in partnership with Stanford Medicine. The industry often says “insurance is all about data” so those tech giants are leveraging IoT devices and wearables to collect behavioral data on their customers. In 2017, 310M wearables devices were sold Worldwide according to Gartner. 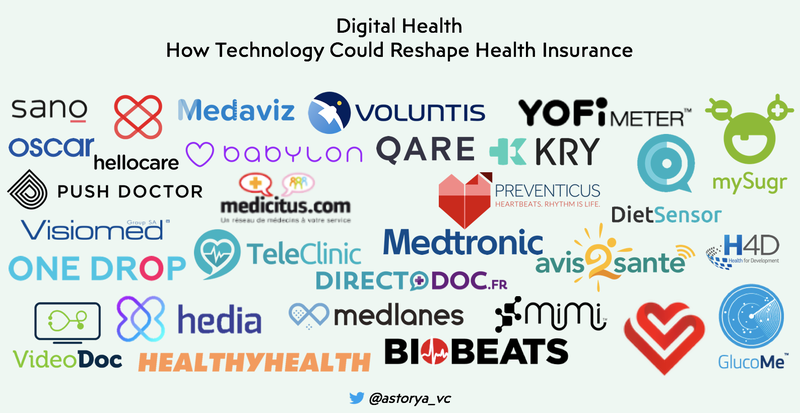 This might be a key advantage for these companies in the coming years especially to feed algorithms — that become more relevant with higher amount of data — and a first step before launching health insurance products. Also, Amazon recently partnered with JP Morgan and Berkshire Hathaway to enter the health insurance space with a preliminary focus on their US employees. Beyond that initiative, it is said to be talking with generic drug companies. This could make sense to leverage its supply chain and apply its effective processes to drug delivery, reducing the cost of medicines for patients. This is a current challenge for insurers that build networks of trusted-partners with whom they could agree to get cheaper prices for their customers in exchange for lead generation (e.g. with garages, drugstores, hospitals, …). To face with these external competitors, insurers are increasingly claiming they want to change their relationship with customers. By trying to collect more customers’ data, they hope to better understand their needs and increase the level of engagement they have with them by adding numerous touch points. In the US, AXA has partnered with Oscar Health, the first and biggest 100% digital health insurance player, that plans to generate $1B in premium revenue this year according to its CEO. Beyond that re-insurance deal which is a clear sign of interest for innovation in that space, it bought out Maestro Health earlier this year for $155M. With this platform, SMEs can manage their health-benefit administration in a more effective way, leading to cost reduction. Interesting to see that those innovations happened in the US where the insurer is not already a health insurance player. In Europe, it partnered with H4D that develops stations with all devices required to manage a proper consultation. They plan to instal them in SMEs to ease access to a doctor and differentiate from simply reimbursing claims. This is an upgrade of their teleconsultation service they have been providing since 2015. Many mutuals are also offering teleconsultations to their customers: Matmut is partnering with the startup Medaviz and Harmonie Mutuelle bought out the startup MesDocteurs.com late last year. AG2R La Mondiale launched a Digital Health app kiosque in 2016 to showcase mobile apps customers can trust either in the fitness, wellbeing or healthcare space. And more broadly, Generali launched a health initiative ‘Vitality’ to support customers to have a healthier behavior. It is said to have 2,000 SMEs with 40,000 employees subscribers by the end of last year. This solution is distributed through corporates and HR services. Employees get rewarded by coupons they can use to buy gym lessons, sportswear items, etc. Recently they partnered with Nokia Health to offer 40% discount on 2 wearables every year to the ‘Vitality’ customers. So far most of the initiatives are built this way. Back in 2015, John Hancock offered discount on health insurance policies to their US customers that agreed to share data. Most of these initiatives involve startups. And actually that’s the point: there is no one-size-fits-all solution. Insurers need to develop an ecosystem of technologies and startups around them to address their current challenges: increase number of touchpoints with customers ; understand behaviors to better prevent risks ; and reduce costs of healthcare. Startups could focus on technology and corporates could distribute it to their numerous customers. It is even more promising when algorithms are involved (on prevention, risk scoring, detection, …) as startups will need huge amounts of data to become more relevant. Being distributed through corporates could obviously accelerate their development and most of all improve their relevance. This should explain why $5.8B were invested last year in Digital Health startups Worldwide according to RockHealth, which is a 30% yoy growth. To increase number of touchpoints and offer additional services, teleconsultation is now a must-have for most of insurers and mutuals. According to Roland Berger, that space will grow Worldwide from $14B in 2016 to $26B in 2020. We’ve seen many startups addressing that space. In the UK, Babylon raised $85M to leverage Artificial Intelligence on top of its video service. Push Doctor or VideoDoc are addressing that market as well. In Germany, Medlanes and TeleClinic are offering teleconsultations. In France, we saw many competitors as well: MesDocteurs.com (now part of Harmonie Mutuelle as mentioned earlier), Medicitus, Hellocare, Medaviz, Directodoc, Avis2sante or Qare. And more generally in Europe, several players are offering this kind of services: ViviDoc in Belgium or KRY in Sweden (here, we have gathered 40+ European startups addressing the teleconsultation space). All those players are not delivering the same level of services: from confcall with a doctor, to video consultations through a mobile app, or use of Artificial Intelligence to collect symptoms and pre-qualify diseases before any interaction with a real doctor. The biggest player in that space, though, is the Chinese Ping An Good Doctor that raised $500M in 2016 and is now considering a $1B IPO. With 9% of people suffering from diabetes Worldwide according to the World Health Organization, many startups address the diabetes market. Most of these startups are leveraging a hardware piece: YOFi Meter, VisioMed, MySugr, GlucoMe or Voluntis sell a connected blood glucose meter ; Medtronic has developed a continuous glucose monitoring product to connect with your smartphone. DietSensor has launched a Diabetes-related app that helps have healthier nutrition especially to count carbohydrates or manage weight loss. You can even synchronize it with the ‘SCiO’ device from Consumer Physics to scan food and directly get all details on their chemical makeup or nutritional values. One Drop leverages as well hardware and software to improve behaviors. Hedia has developed an app leveraging Machine Learning to help better manage your diabetes by suggesting the right insulin dosage you need based on your behavior. To go deeper in prevention, several startups are now gathering data from many sources (wearables, mobile tracking, …) to assess your level of risk against specific diseases. HealthyHealth in the UK, has developed an algorithm to predict the probability of contracting one of the 200 diseases it is tracking. Behind, it helps you prevent from those diseases by having a healthier behavior. BioBeats focuses on preventing from stress diseases. It collects data from any kind of wearables, assess your level of stress thanks to Artificial Intelligence and then engage with you to reduce that level. Mimitec has developed ‘health@home’, a hub to gather health data that feeds their Machine Learning platform to understand your behavior and then engage with you to be healthier. vHeart in Croatia or Preventicus in Germany, leverage Artificial Intelligence to make real-time electrocardiogram interpretation and allow doctors monitor their patients online. This is a combination of prevention, where the technology helps have a healthier behavior, and cost reduction by avoiding unnecessary doctor’s appointments. And even further, technology could help doctors be more effective when it comes to MedTech. IBM’s Watson is famous for being able to detect cancers thanks to Artificial Intelligence, and its Project Blue Sky is analyzing data to improve both Parkinson detection and treatment. To better predict and prevent diseases, technology requires a huge amount of data to be relevant, and we see many startups monitoring behaviors on a real-time basis. This raises the first challenge for both insurers and startups: make people agree to share their personal data. Customers really need to perceive benefits to allow companies access such sensitive data. It’s even tougher with the GDPR (European regulation on use of personal data) coming as companies will need a proper consent from their clients to collect any data and leverage them. Only startups or corporates with great products and UX will manage to get access to those personal data. Then comes the challenge to secure those data against Cyber attacks as patients need to be sure no leak could happen among exchanges between doctors, hospitals, drugstore, etc. And startups or corporates are responsible for those data. Cybersecurity has a huge playground here as Digital Health is still in early days, and insurers are eyeing on those technologies to reshape the way to think about health insurance.